Has your spouse or significant other been bothering you to get rid of some of those books spilling off your shelves onto the floor? Or do you love going to the art section at your local book store but balk at the price of a new book? 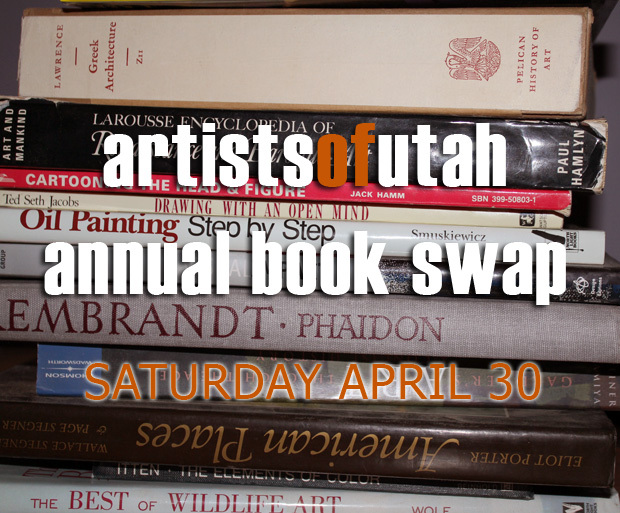 Try the Artists of Utah Book Swap, Saturday April 30, from 10 am to 1 pm at Saltgrass Printmakers, 2126 South 1000 East, SLC. Donate your unwanted books to a worthy cause or come find a treasure of a book at a great price. HOW IT WORKS: Bring in two books, take home one. Or make a contribution to Artists of Utah and take home what you feel is a fair amount. WHAT WE’LL BE SWAPPING: The book swap will include all kinds of new and used art-related books: monographs, art history, art-related novels, instructional books, books on Utah art, magazines, exhibition catalogues, etc. DONATE BOOKS: If you have books to donate you can drop them off in the drop box any time between now and Saturday at Saltgrass Printmakers, 2126 South 1000 East, SLC (Please include a piece of paper with your name and email if you would like us to send you a receipt of your donation). Or, if you have a handful or more of books email us (webmaster@artistsofutah.org) and we’ll schedule a time to pick them up. If we’re able we’ll send the book swap on the road. Let us know (webmaster@artistsofutah.org) if you would like to host the swap in your community.